Born and raised along the shoreline of California, Caleigh now lives in San Francisco. Diagnosed at birth with cystic fibrosis, Caleigh maintained her health through sports and social activities. Despite her best efforts to balance health and happiness, she found herself battling end-stage lung disease, intermittently hospitalized, and in need of a double lung transplant. 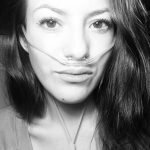 Since receiving new lungs, she lives an independent and successful life achieving new goals every day - including chronicling her journey on her blog Fight2Breathe, and beginning her own legacy through her foundation.